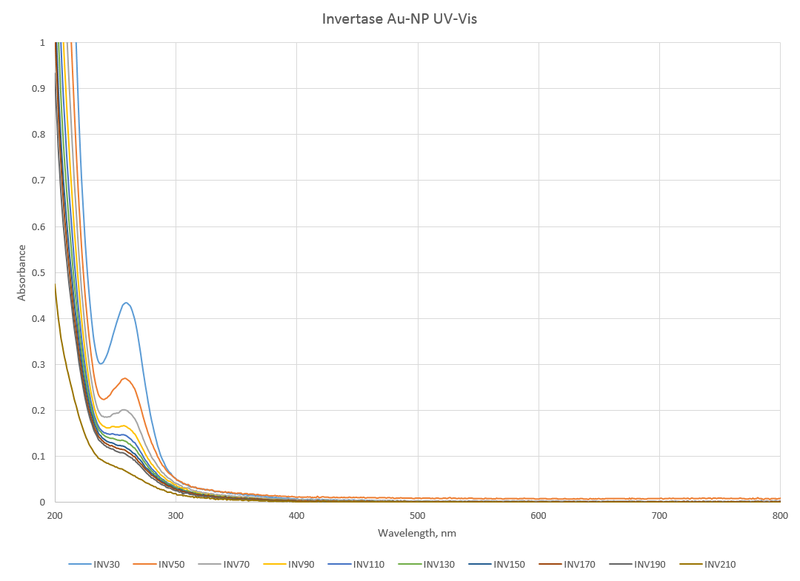 To synthesize BSA-AuNPs and run UV-Vis on the invertase-AuNP solutions created yesterday. Add 0.0562 g of HAuCl4·3H2O to a 50 mL volumetric flask and fill with distilled water. The final concentration of gold stock was 2.85 mM. Add 0.0260 g of BSA to a 25 mL volumetric flask and fill with distilled water. The final concentration of BSA stock was 15.65 μM. As seen below, the corresponding amount of protein was added to a 50 mL volumetric flask and filled with distilled water. The samples were made in small test tubes and capped with aluminum foil. The samples were heated at 80°C for 4 hours.